The Mitchell Map, or Map of the British and French Dominions in North America, believed to have been created in 1754 or 1755, is the work of John Mitchell, who came from a wealthy Virginian family. He was not a professional cartographer by trade, and his formal education was in medicine and botany. His map was reprinted numerous times during the second half of the 18th century. It is said that Mitchell was inspired into map-making being distressed by what he saw as the lack of interest by London politicians regarding colonial affairs. He wanted to warn them of the French threat to British colonies and as such, took it upon himself to make a map of North America in 1750. His work impressed George Montagu-Dunk, 2nd Earl of Halifax, who opened up the official archives and permitted Mitchell to improve upon existing maps of the colonies. Subsequently, in 1775, Halifax permitted Mitchell to have one of his manuscript maps published. That map became known as the Mitchell Map and was used during the Northwest Ordinance and the Treaty of Paris to establish the boundaries of the freshly created United States, and as such, was important in resolving border disputes between the United States and other entities. The Mitchell Map was a thorough representation of eastern North America during the colonial period. It was printed in eight sheets, which shows the southern colonies extending across the entire North American continent, from the Great Lakes to the Gulf of Mexico and from the Appalachian Mountains to the Mississippi River. The map shows the British and French territories with the roads, distances, limits and the various settlements. 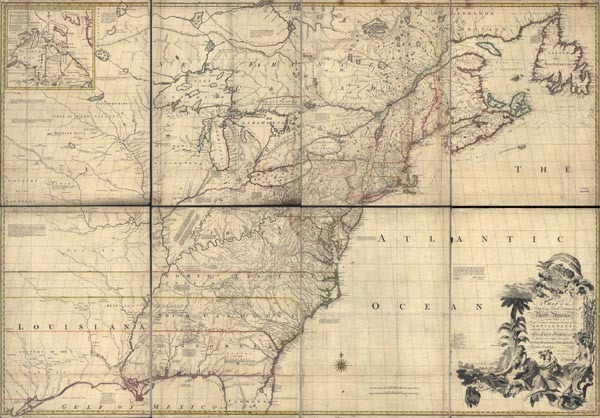 The map John Mitchell was a reliable source of reference beyond solving diplomatic disputes because it was considered well researched and detailed in its depiction of early America. Throughout the map are texts describing and explaining various features of the region, particularly in areas that were not well known, or were under dispute. Many Indian tribes and settlements are shown, as well as crucial Indian trails. Depicted between Virginia and New York are the Iroquois lands (British territories), an indication of the Iroquois people as subjects and allies of the British. The French activity within the Iroquois lands is noted as illegal. The map also has certain inaccuracies, including the notion that the Mississippi River extended north to the 50th parallel into British territory. Still, the Mitchell Map was simply the best depiction of early America during the late eighteenth century. ← Weekly Map Giveaway Winner!